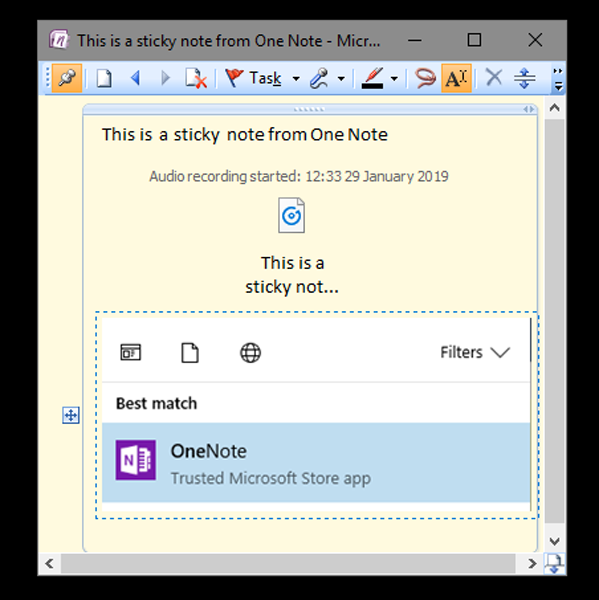 All most every version of Windows comes with the Sticky Notes app inbuilt, if not it can be easily downloaded from the Microsoft Store for free. With all the usability quotient it has got, there are problems with Sticky Notes. You cannot set reminders, alarms, passwords or send the Sticky Notes through email. Heck, you cannot even paste pictures or print your notes. If you feel these problems too then it is better to switch and here are some solid alternatives for Sticky notes. 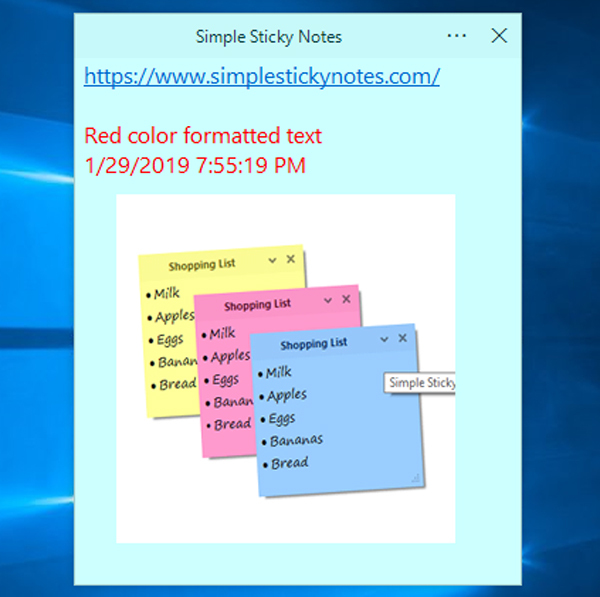 In this article, we’ll take a look at some of the best alternatives to Windows native Sticky notes app. If you are looking for Sticky notes alternative for macOS, check out the inbuilt Notes app or Unclutter ($9). Simple Sticky Notes looks similar to the native Sticky Note app but goes a mile ahead in terms of features. It has the same layout and a bunch of text formatting options like different font styles, font colors, hyperlink. The notes support Images, Date & Time as well as special characters. If you have already copied the text onto the clipboard, you can choose to create a sticky note directly with the copied text in it. You can trigger this by pressing Alt+V which serves as a hotkey. The app houses many hotkeys as triggers and you can customize them as per your preference. The settings menu lets you back up the sticky notes to a database file and restores from the same. You can easily transfer this database file through the Network and restore your notes back on the other system. 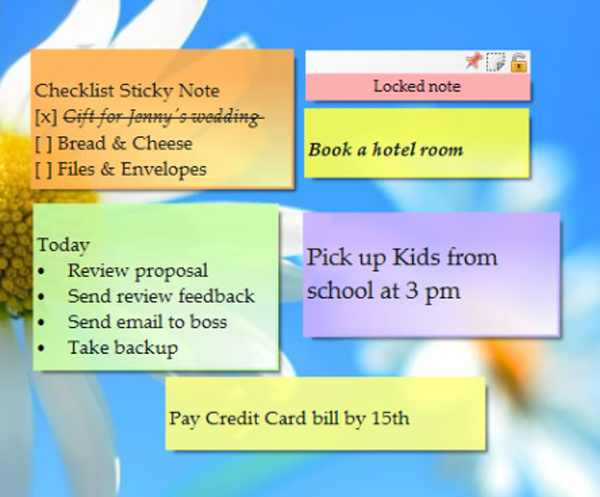 The Sticky Notes manager lets you manage all the notes through a single screen. The added feature which I liked was the Recycle bin which consists of your deleted Sticky Notes and you can even choose to restore them back. Where simple sticky notes fell short is the security. You cannot encrypt the database file which makes it vulnerable if you transfer it over the network. You cannot lock the Sticky Notes, so it can be accidentally or easily modified by people using your laptop. The app doesn’t let you export the Sticky Notes in a .pdf or .docx format. 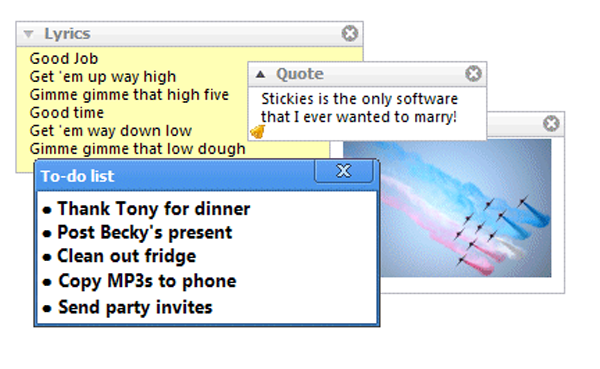 Apart from all the features that Simple Sticky Notes provide, Stickies lets you lock the content of your Stick Notes. At times, I end up writing my passwords on the sticky notes which is not a good practice but Stickies lets you get away with that by encrypting your sticky notes. You can choose a strong password and encrypt the stickies and this will keep them locked and invisible. 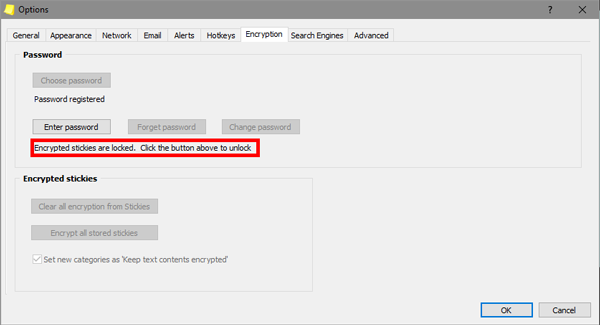 You need to be careful with the password because there is no option to retrieve your stickies if you forget the password. 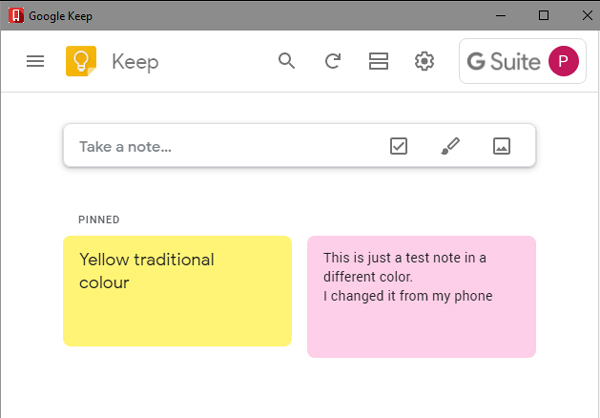 Stickies also lets you quickly Google the text in your sticky notes but it inherently uses Internet Explorer as the browser which is not something many would like. 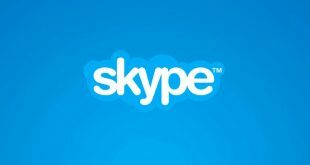 There is an added feature that lets you attach stickies to a particular application or window which triggers it to pop up as soon as you open the specified application. You can choose to add friends in Stickies and send them Sticky Notes directly via their IP addresses. The app has an option to enter SMTP configurations which enables you to directly send sticky notes via email. Although Stickies has all the advanced features that you could ask for, it lacks a basic spell checker. The app also doesn’t provide you a search menu on the go so you have to scale through the options menu to reach the search bar. You don’t get any cloud storage and the notes are backed up on your local disk. 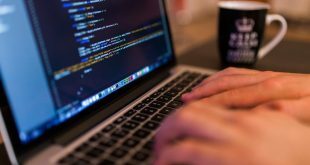 Unlike all the other apps in this list, NoteZilla has a full-fledged suite of mobile and desktop applications. That means you can sync your sticky notes from your mobile to the desktop and also store them on the cloud. You can readily download your sticky notes on any devices by just signing in with your NoteZilla account. Obviously, this comes with a price tag of $ 15/year. Initially, you get a 45 day trial period. The search bar provided helps to search through the sticky notes and that helps if you have a lot of Sticky Notes lying around. 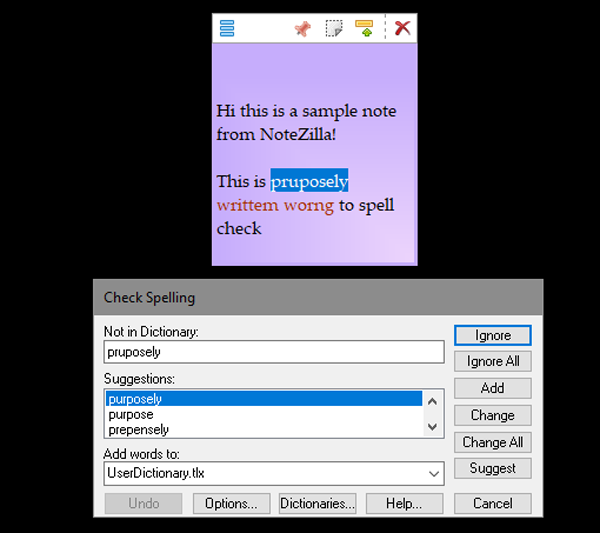 Unlike the above-mentioned apps, NoteZilla has an inbuilt spell checker which marks the text red if it is misspelled. It has an inbuilt dictionary where you can add words over a point of time. It has an intuitive Send Notes menu where you can choose to add people by IP or DNS names. You can also create a group with a bunch of people just in case if you want to send the notes to all of them at once. All the people should have NoteZilla installed on their system. This works great within a workspace where you share a lot of data with each other. I could hardly find any downside in NoteZilla except that you cannot choose to lock individual Sticky Notes with a password. 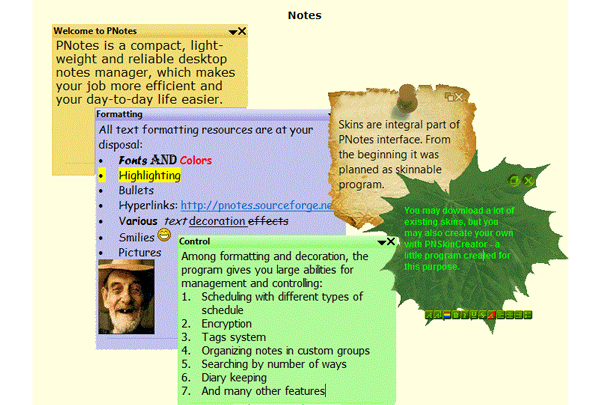 PNotes.NET is a portable alternative to Sticky Notes with almost all the features I can think of. It is a freeware that runs on top of .NET framework 4.5 which makes it Windows-dependent. They have an older variant called PNotes which can run on any platform since it is written in C.
PNotes lets you password-lock and encrypts each Sticky Note individually. This is a handy feature to keep your credentials safe on a sticky note from unwanted access. A convenient feature which I found was Diary which creates a sticky note titled with the current date. This really helps to sort the sticky notes based on dates. Unlike Stickies, PNotes uses your default browser to quickly search texts from the notes. It also provides you the option to export sticky notes to PDF, RTF or One Note etc. This could be the epitome of all sticky notes but so many features make the menu quite cluttered which is quite scary to look at. Since this is portable the app it needs to be running the entire time in the background. There are times when the app ceases to function in the background and this causes an annoying dialogue box to pop up every time. This is sort of an alternative if you are too deep into the Google system. It is a web app but can be easily converted to a standalone app using the Web2App platform. The UI is minimal and clean and the real-time syncing works effortlessly like any other Google Product. Download the Keep Notes mobile application and all your notes will be accessible through your mobile device. You can set reminders like any other Sticky Notes app but since this product is from Google, the reminder is synced with your Google calendar app and the reminder is synced with your phone. None of the sticky note apps have a speech-to-text option but with Keep, there is a workaround available. You can dictate the notes to Google Assistant which will, in turn, save them to Keep and this makes it really handy. 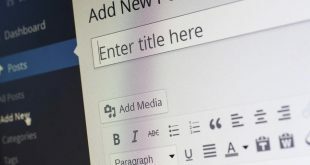 If you browse a lot over the Internet then you can try the Chrome extension which lets you quickly save any text from the browser to keep with just a right click. The only downside to this is that there is no dedicated app for windows. 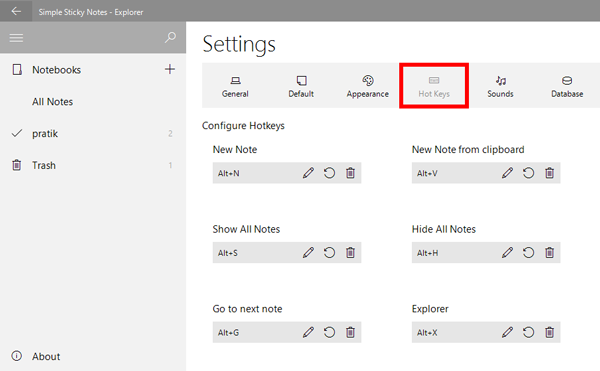 I know One Note is not sticky notes and it shouldn’t be an alternative to Sticky Notes but comes bundled with the Office 365 suite and you can also use it as a sticky note with its Quick Note feature. As soon as you press Win + N, it opens a side note which is like a floating window and you can quickly note down things. This option works even if One Note is not running in the background. Since you are using One Note, all the features of Note are inherently present on Side Note. You can do text formatting, set reminders, add pictures and the most salient feature that I tend to use the most is the voice recorder. Instead of typing simple information, I rather record them for later use. It would have been great if there was a speech-to-text converter. You can save all your notes on One drive and it can be easily synced throughout your devices. Which is the best Sticky Notes Alternatives? If you just need a basic Sticky Notes with basic added features, Simple Sticky Notes should be the ideal choice. You can give NoteZilla a try since it has a good package for all your devices. Keep Notes is good for Android users who occasionally use sticky notes on the desktop. If you don’t want to install any 3rd party apps, One Note should do the job pretty well. Let me know what’s your choice in the comments below.